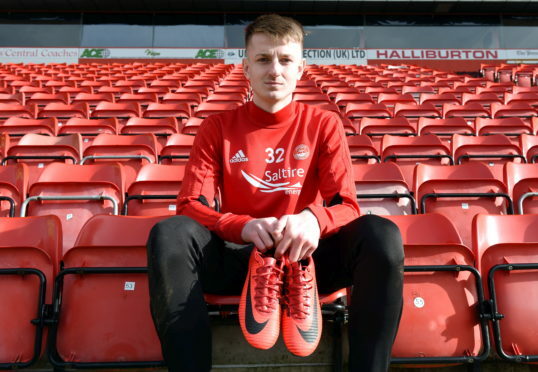 Aberdeen youngster Sam Roscoe is on loan at Alloa Athletic. Sam Roscoe feels Alloa is the best place for his development, as he would be stuck playing reserve football at Aberdeen. The on-loan centre-back has been a regular for the Wasps since joining in August, playing all 12 league games and helping keep the only part-time in the Championship out of the relegation zone. He is at the same club Scott McKenna spent a short spell on loan with during the 2015-16 campaign and the Scotland international has been in contact with Roscoe to check on his progress. The long-term goal is to play for the Dons and he was on the bench for the Betfred Cup win over St Mirren this season. However, Roscoe is more than happy where he is just now. The Manchester-born defender said: “I’m really enjoying it. It’s a different challenge to playing under-20s every week and hopefully it’s showing everyone, including people at Aberdeen, that I can do it playing men’s football every week. “My game has come on a lot. You don’t realise until you make the step into first-team football. You play to win, whereas at under-20s sometimes you’re playing for a good performance. Here you’ve got to win or you’re in trouble. “There’s more intensity – it’s all about winning. At under-20s you can come away losing, with the coach being happy with your performance. Here, winning is everything. “Scott has spoken to me. I didn’t know he’d been here but a couple of the boys told me. He’s always asking how I’m doing, which is good for him as he plays in the same position as me at Aberdeen. “It’s good for people like me to keep learning from guys like Scott. It’s important, because it shows they pay an interest. “The long-term aim is to go and play for Aberdeen. But at the minute, I’m enjoying playing here because if I went back to Aberdeen, I’d just be playing under-20s football. “I speak to the management staff on a Monday after the game and they’ve been down to a couple of games. They see I’m doing OK here and they’re happy with that. Roscoe was part of a dogged rearguard effort for the Wasps at the weekend, which nearly kept Ross County at bay until Keith Watson’s stoppage-time winner. He added: “You learn a lot, especially being under the cosh for so much of the game. You learn how quick their movement is and you have to be alert. Once you switch off for a second that’s when they get chances.